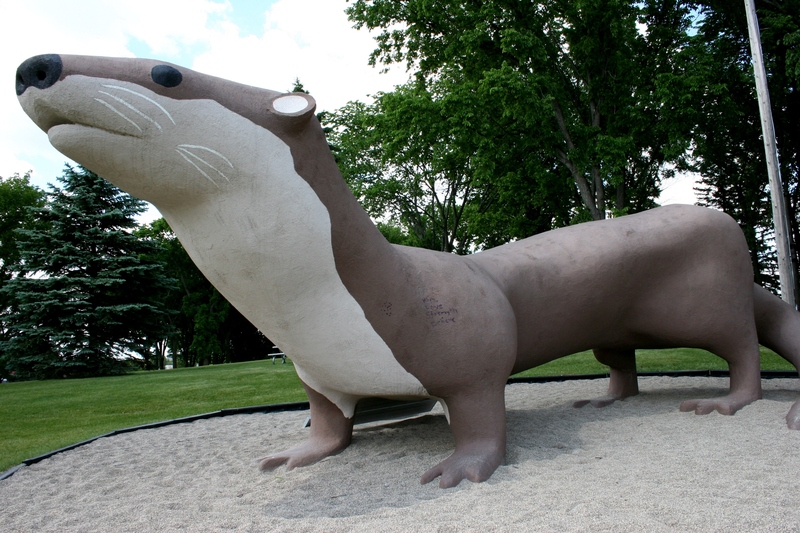 BECAUSE WE MISSED the turn, we missed the kids—the kids perched like birds on a telephone wire atop Otto the Otter. 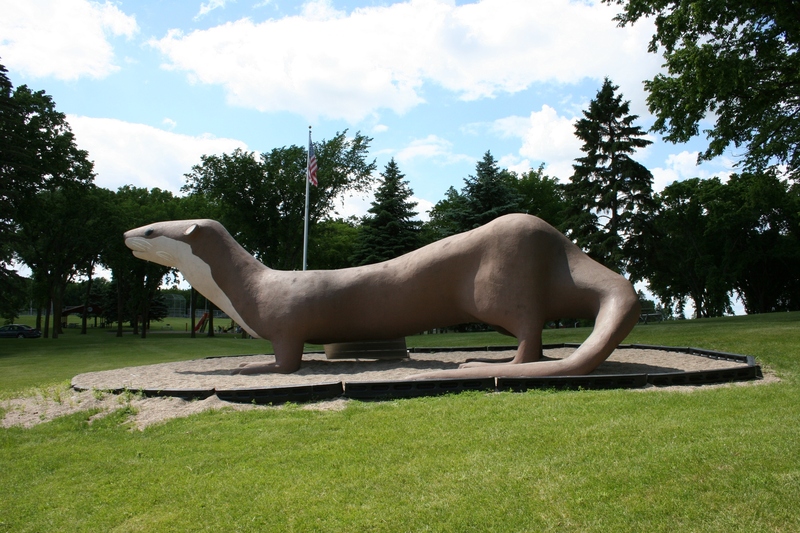 They would have added so much to these photos of the otter statue along Grotto Lake in Adams Park in Fergus Falls. Oh, well. They were flying past their dad back to the playground when we pulled into the parking lot. So this would be just me and the husband, whom I couldn’t convince to pose with Otto. I did. But since I don’t look nearly as cute as those kids, you won’t see me leaning lamely against the otter in an image published here. That’s reserved for the family photo album. I chose to ignore the spouse’s suggestion that I clamber atop an overturned picnic table and scramble onto Otto’s back. Like, do you think I’m 10 or something? I have an artificial hip, remember. Do you want me tumbling off this weaselly animal onto a pile of goose poop, tending me while waiting for the ambulance to haul me to Lake Region Healthcare? Except for the goose-pooped lawn, our visit with Otto rated as fairly enjoyable. 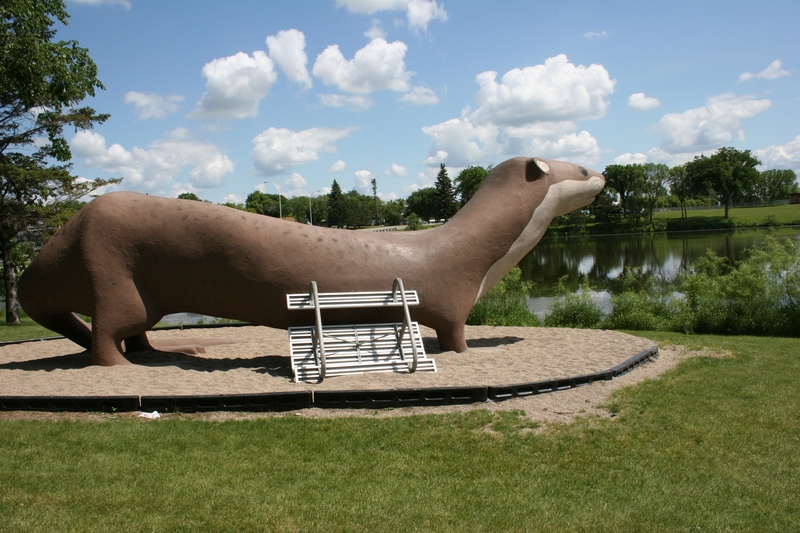 I mean, I really do appreciate viewing kitschy outdoor art like this gigantic otter statue under a beautiful summer sky in ideal temperatures (meaning 70ish and no humidity) that rank as nothing short of Minnesota weather perfect. 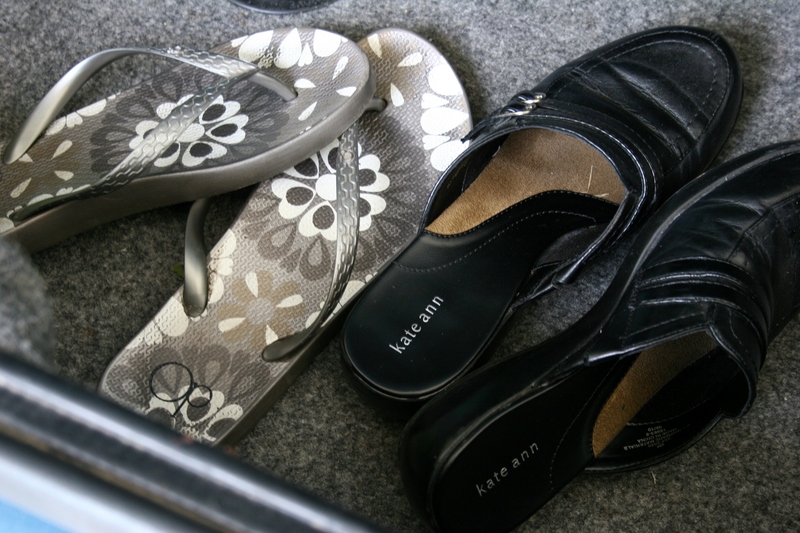 It’s just that I should have scraped the goose crap from my shoes before removing them, slipping my feet into flip flops and placing the poop-slimed shoes into the trunk of our car. For purposes of this story, I have staged this shoe photo, without the goose poop, as a visual reminder to always, always wipe the goose poo from your shoes before placing them inside a vehicle. Words to live by as far as scraping goose poo off your shoes. I’ll keep that in mind. Yeah, I thought he should have climbed onto that otter’s back. I mean, how often do you get a photo opp like that? Unfortunately, goose poop seems to be a problem in many city parks, including those in Faribault. Thanks for the additional info about Dairyland. It was a quick evening stop. Unfortunately, I doubt I’ll get back to Fergus anytime soon. My son transferred from North Dakota State University (which we were en route to) to Tufts University in Boston. So no more Fargo trips. I do love Fergus Falls, though. It was my second stop there after an initial visit to view my poem on Roadside Poetry billboards several years ago.